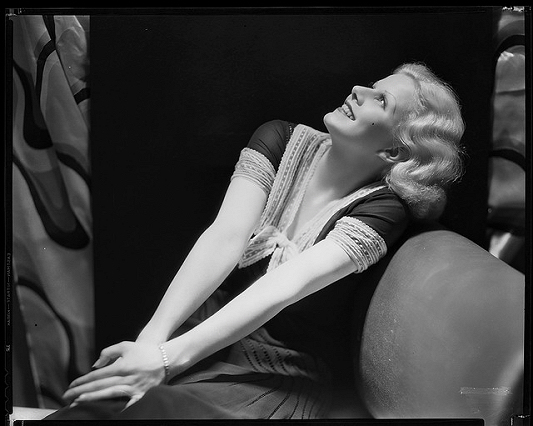 Blogging for Baby: beginning of the Jean Harlow centennial week! March 3, 2011 will mark the 100th birthday of one of the greatest screen icons and comediennes of all time; Jean Harlow. Harlean's Heyday, named after the actress, is extremely pleased to take part in the first ever Jean Harlow Blogathon this week! It means that all of this week my blog will be dedicated to Jean. I will be watching and reviewing her films, looking at her life and, of course, discussing Jean as a vintage fashion icon. The Kitty Packard Pictorial is bringing together all of the bloggers who will be writing about a vast array of topics in honor of our beloved Baby's centennial. Looks to be a truly swell and fascinating line-up so be sure to keep your eyes peeled at The Kitty Packard Pictorial to stay updated on all of the exciting happenings! 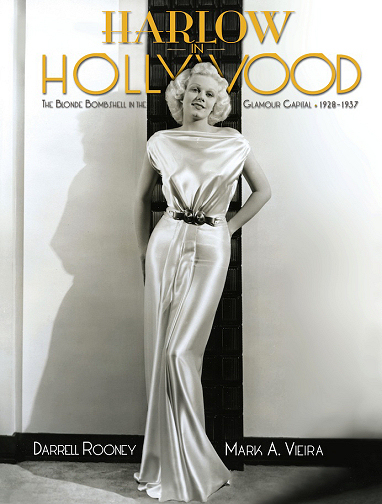 Jean's life and legend is celebrated in a new book by collector Darrell Rooney and Hollywood historian Mark A. Vieira, titled Harlow in Hollywood: The Blonde Bombshell in the Glamour Capital, 1928-1937. The book, which releases March 1, seems to be a true must-have for all the fans. It is stacked with rare and previously unpublished photos and prides to feature accurate information on Jean, the places where she lived and worked, and 1930s Hollywood itself. It has been a while since I've been this excited about an upcoming book release - I truly cannot wait to get my hands on this one! Click here to further details on Harlow in Hollywood. 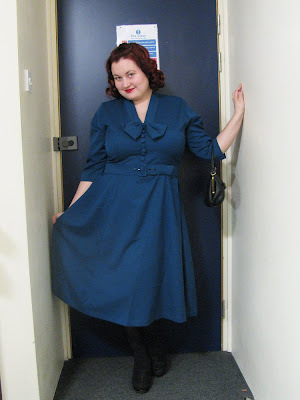 I got some money for my birthday so I ended up ordering a custom made dress from Top Runway, made from a 1950s vintage pattern. I opted for the Top Runway dress not only because it is super cute (I kind of have a thing for bows and buttons!) but also for practical reasons. Their dresses can be washed in a washing machine and the fabrics require very little ironing, which is a big win in my book. Both of my Top Runway dresses are also very versatile; they can be worn throughout the year regardless of the season, day or night. The dress is teal, just looks more blue in the dark photo. Sorry, I still have not figured a better way to snap outfit photos without going outside and feeling self-conscious about it, heh. I paired the dress with black vintage accessories, wool stockings and, of course, my Energy Red Lip Ink before heading out for dinner with my girlfriends. I spent the day with my lovely friend Kendra today. We grabbed some yummy lunch in Chinatown and headed out to the Wellcome Collection to see various weird and wonderful objects. We saw the permanent collection as well as an exhibition on mind altering drugs in history and culture. 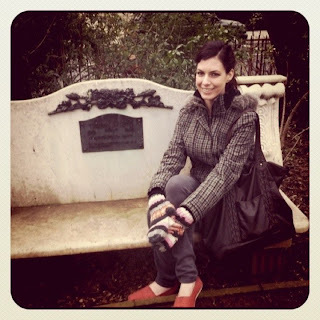 We also continued our geeky old movie tour of London by visiting a couple of locations related to the life and career of Vivien Leigh. We checked out the Theatre Royal, Haymarket, where Vivien starred in The Doctor's Dilemma back in 1942. We also headed out to 54 Eaton Square in Belgravia to see the flat that Vivien used as her home in the city from the late 1950s until her death in 1967. This was the first time I've actually seen the building without scaffolding as it was under construction last time I made my way there. 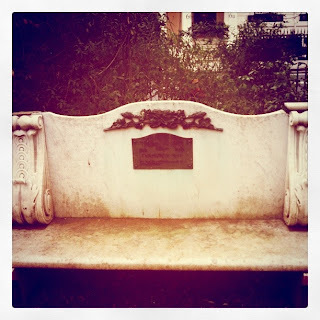 Another treat was that a nice security guard kindly offered to let us in to the garden to see the stone bench dedicated to Vivien's memory by her mother, which I'd never seen up close before. I'm on a mission to make more time to snap outfit photos before heading out the door so here's a very casual look that I photographed just before class. It is something that I put together from various things that I've had for quite a while, paired with my custom made 1940s style wool high waist trousers (by Big Beautiful Barbara Brown). 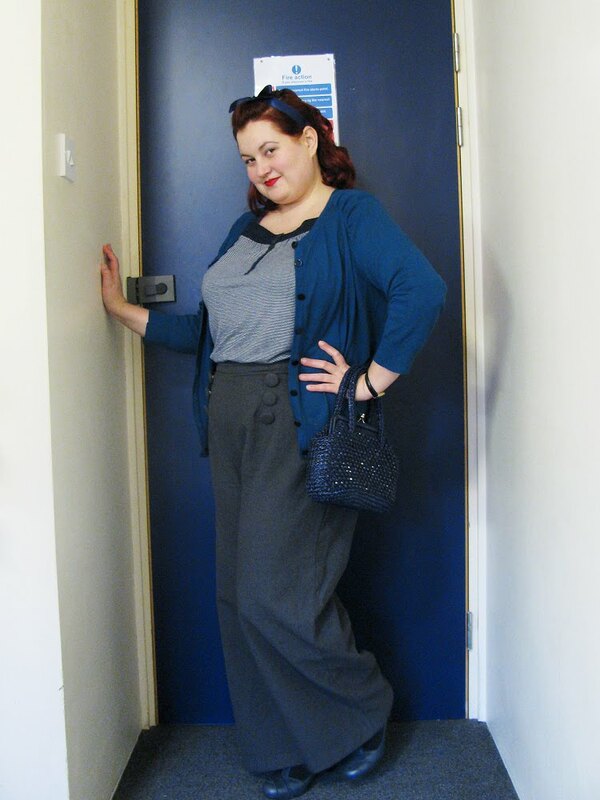 None of it vintage, apart from the handbag. But perfect for the current London weather, which is still a tad chilly.